In a large stockpot, add water to a depth of 1 inch bring to a boil over high heat. 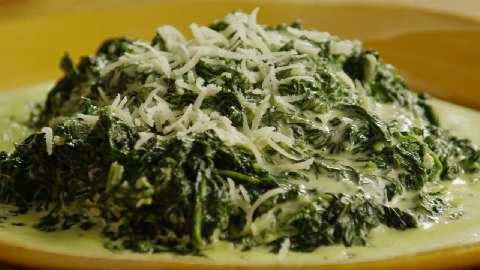 Add spinach, add cook, stirring often for 3 to 5 minutes or until spinach wilts. Drain spinach, and press between paper towels to remove excess moisture. Chop spinach. In a large skillet, cook bacon over medium heat until crisp. Revove bacon to paper towels to drain, reserving drippings in skillet. Crumble bacon. Cook onions in hot drippings over medium heat for 1 minute. Sprinkle flour over onions; cook, stirring constantly, for 2 minutes. Reduce heat to low, and stir in milk cook, stirring often for 2 minutes or until mixture thickens slightly. Stir in sour cream, cream cheese, salt, and pepper until smooth. Stir in spinach. Sprinkle with crumbled bacon.